Kate Newberry is a Senior Research Scientist in the Department of Leukemia at The University of Texas MD Anderson Cancer Center collaborating with Dr. Srdan Verstovsek, MD, PhD and the MPN team on clinical and translational research. She received her PhD in Biochemistry and Molecular Biology from the University of California, Santa Barbara in 2002 and completed postdoctoral training in Biochemistry and Biophysics at Oregon Health and Sciences University and MD Anderson Cancer Center. 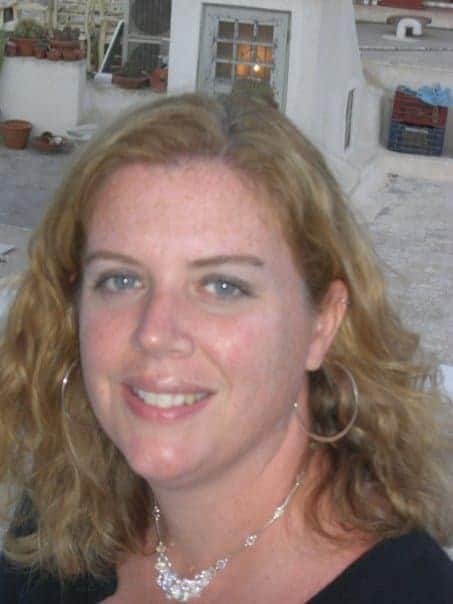 She is the managing editor of MPN Focus, a periodic newsletter published by The Hanns A. Pielenz Clinical Research Center for Myeloproliferative Neoplasia at MD Anderson Cancer Center. As David discussed in Part 1 of this series, itching, especially after bathing, is a common and troublesome symptom of polycythemia vera (PV) and other myeloproliferative neoplasms (MPNs). Itching has been reported in up to 85% of patients with MPN. While the biological basis of itching is not fully understood, the itch sensation is recognized in the brain by signals sent from specific nerve fibers (neurons) within the skin that respond to various types of stimuli. Histamine is one of many stimuli that activate sensory neurons. Histamine is generated in white blood cells that are part of the body’s immune system. All three cell types contain granules (storage sacs within the cell) that contain histamine and other molecules that act as “chemical alarms.” Mast cells reside in most tissues within the body, while eosinophils and basophils are found in the circulating blood. 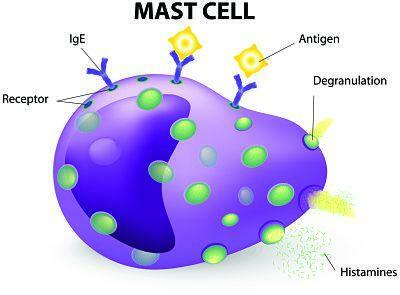 The majority of the body’s histamine is stored in the granules of mast cells. Histamine is released from these cells in a process called degranulation. Degranulation occurs when antigens interact with IgE molecules that are bound to receptors on the surface of mast cells, basophils and eosinophils (Figure 1). Once the cells are activated they release the contents of their granules, including histamine and other mediators of the immune response. So how exactly does histamine cause itching? Histamine is a biologically active molecule that has an effect on a multitude of bodily processes ranging from the allergic response, to gastrointestinal function, and the regulation of the sleep wake cycle (see Figure). Histamine exerts its action by binding to histamine receptors on the surface of cells. The H1 receptor is found throughout the body, including the brain, skin and organs. The H1 receptor is found on sensory neurons and thus is involved in the perception of itch. The H2 receptor is found on specialized cells in the stomach and cells that comprise the blood vessel walls. Activation of the H2 receptor leads to dilation of the blood vessels and gastric acid secretion. The H3 receptor is found in the central and peripheral nervous system. The H4 receptor is found in the bone marrow and white blood cells, as well as in the thymus, small intestine, spleen and colon. It plays a role in the migration of mast cells, itch perception, cytokine production and gastrointestinal pain. The effects of histamine are dependent on how much of it is present in the blood. At amounts slightly higher than normal, you get increased heart rate and increased secretion of gastric acid. As the level further increases, you can have headaches, flushing, hives and itching, and at very high levels it can lead to anaphylactic shock. As David and other MPN patients have discovered, a combination of 2 different types of antihistamine can greatly alleviate MPN-related itching. Zyrtec (cetirizine hydrochloride) blocks the H1 receptor, while Zantac (ranitidine HCl) blocks the H2 receptor. All of this suggests that if you can sufficiently reduce the histamine levels you can combat the itching. Below I will discuss some of the scientific evidence regarding the role of mast cells and histamine in MPN-related itching. The role of mast cells in MPN-related itching has not been well-studied. Some evidence shows that mast cells in MPNs are functionally abnormal. For example, one study (Ishii, T et al. Blood 2009) showed that mast cells from MPN patients release significantly more histamine, leukotrienes, and IL-31 (all mediators of the allergic response) than normal mast cells. The authors showed a correlation between the presence of itching and a larger number of mast cells. Others have shown increased levels of histamine in the blood and urine of MPN patients. However, evidence of a correlation between histamine levels and itching in MPNs is conflicting. In fact, Ishii and colleagues did not find a correlation between presence of itching and levels of histamine released from MPN mast cells. Interestingly though, they found that MPN mast cells released higher levels of prostaglandin D2 (an inhibitor of itching), but the levels were significantly decreased at higher temperatures, suggesting that perhaps the itching induced after a hot shower is due to the lower levels of prostaglandin D2. A follow-up study by the same authors (Ishii et al. Leukemia 2009) found that mast cells from patients with PV and PMF showed increased activation. However, it is important to remember that these studies were all performed on cells grown in vitro (in a petri dish) and therefore are not definitive. In another study, skin biopsies were taken from the abdomen of PV patients after exposure to either warm water or room temperature water (Abdel-Naser et al. 2007). The skin biopsies were compared with those from normal individuals. No changes were seen in skin samples from normal individuals when exposed to warm or room temperature water; however, skin samples from PV patients exposed to warm water showed vasodilation and increased numbers of white blood cells. In addition, the mast cells in the room temperature water–exposed skin from PV patients were larger, irregularly shaped, and were densely packed with granules. The skin from PV patients exposed to warm water showed many mast cells that appeared to be ruptured with their granules spilling out. These changes were not seen in the normal skin samples. All of these findings suggest that the mast cells in PV patients may function abnormally and that warm water may induce degranulation and the release of histamine, explaining the onset itching after showering. Clearly more studies are warranted, but it appears that at least for some patients, the Z&Z combo may be the best defense against itching. Last but not least, yet another resource to Help You Beat the Itchies – “Strategies to Beat Itching in Polycythemia Vera.” Hopefully, one of the strategies in the articles above will work for you and now you have a better understanding of the medical background, explaining why you itch. Abdel-Naser MB, Zaki MS, Mousa MH, Hamed H, Rizk MS, Mohamed HE, Habib MA. Cutaneous mononuclear cells and eosinophils are significantly increased after warm water challenge in pruritic areas of polycythemia vera. 2007 J Cutan Pathol 34:924-929. Ishii T, Wang J, Zhang W, Mascarenhas J, Hoffman R, Dai Y, Wisch N, Xu M. Pivotal role of mast cells in pruritogenesis in patients with myeloproliferative disorders. 2009 Blood 113:5942-5950. Wang J, Ishii T, Zhang W, Sozer S, Dai Y, Mascarenhas J, Najfeld V, Zhao ZJ, Hoffman R, Wisch N, Xu M. Involvement of mast cells by the malignant process in patients with Philadelphia chromosome negative myeloproliferative neoplasm. 2009 Leukemia 23:1577-1586.